Will Eyjafjallajokull Cool The Planet? Back in 1991, Mount Pinatubo erupted in the Philippines and kicked up nearly 20 million tons of sulfur-dioxide into the air. The particles spread across the global atmosphere, scattering a greater portion of sunlight back into space, and ended up cooling the Earth by about 0.4°C for a spell. (The sulfuric haze also caused further damage to the ozone layer.) The eruption was a horrible disaster for the immediate area—destroying homes and farmland and kicking up all sorts of nasty air pollution. But from a scientific standpoint, the eruption provided a tidy natural experiment to test various climate models—and, overall, the models were quite accurate in predicting how global temperatures would respond. So what about the Eyjafjallajokull volcano in Iceland that's currently bringing air traffic about Europe to a crushing halt? Could that eruption also cool the Earth? Probably not—as Nicole Allan reports, the current eruption isn't belching up nearly enough sulfates to have a global effect, although if the volcano kept erupting for years and years on end, that could change. 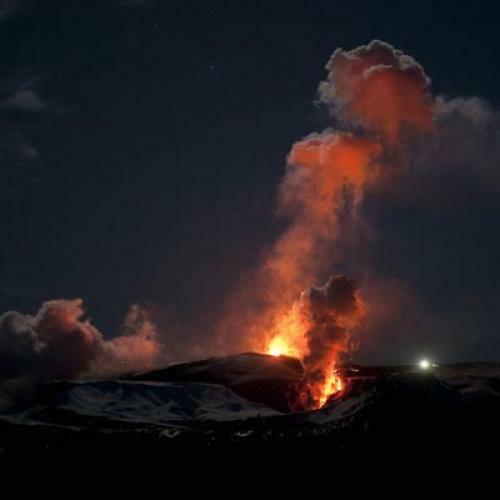 In 1783, another Icelandic volcano, Laki, erupted continuously for eight months and had significant climate effects. That's a pretty devastating way to cut carbon emissions, though. As this story notes, "air freight is responsible for a quarter of the value of all goods moved into and out of the UK." And a variety of poorer countries are getting hit even harder: Businessweek reports that flower and vegetable farms in Ethiopia have already lost $2.36 million due to all the canceled flights. I wrote a longer piece about this topic a few years ago, but greenhouse-gas emissions from airplanes will almost certainly be some of the hardest to cut, since we've become so dependent on flight, there's no easy substitute, and there don't appear to be any technological fixes around the corner.